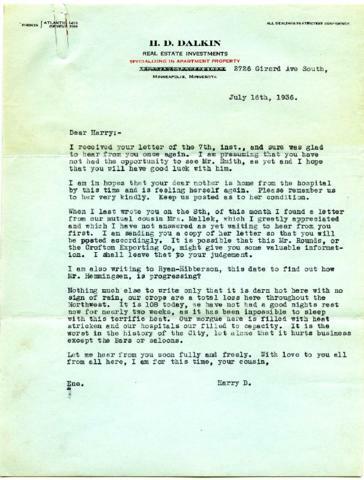 Letter sent to Harry Seidelman from Harry Dalkin in Minneapolis, Minnesota, U.S.A., dated July 16, 1936. Enclosed is a copy of another letter assumed to be sent from their mutual cousin, Mrs.Mallek (Alice) in Victoria, British Columbia, dated July 6, 1936. Indents on both pages from paperclip, and minor rust stains.